TS-coating hardnesses are expressed in several ways. Our friends over-there, the AM-people are usually telling us the hardness as HRC. We EU-people favour HV 0,3 or at least some Vickers. How to convert HRC to HV concerning sprayed coatings at least to get a rough figure. If one uses the tables and calculators found on the net, one gets a too low figure for HV, compared to actual hardness measurements. It seems if one adds 5 to 10 points to the HRC-scale, the outcome in HV touches actual HV-figures. Does anyone have a somewhat "reliable" compensation solution to this. All this only because I'm nowadays, after 40 yrs in the TS-business, entertaining myself by technical translations crosswise between FIN-ENG-SWE. Unless you do a direct comparison between the different hardness tests for your particular coating, then I would definitely say no to any "reliable" generic conversion solution. 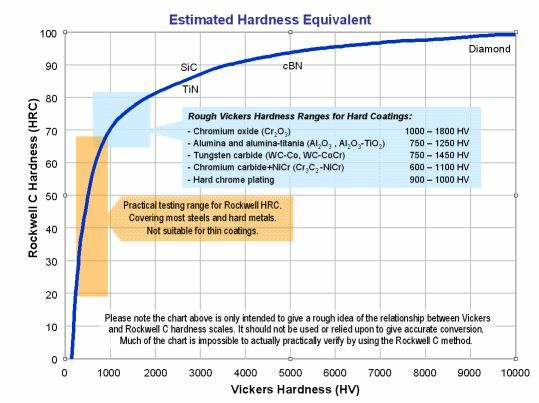 HRC (Rockwell C) is often quoted for thermal spray coatings mainly because people can relate to or visualise this hardness scale better than say Rockwell Superficial HR15N or Vickers. Problem is that the hardness of the majority of thermal spray coatings can not be practically measured using HRC. Most HRC values stated are from generic conversion tables, which are at best rough guides, and in many cases are impossible to confirm by testing when used with TSCs. I think it is a very bad practice to quote HRC values (unless actually tested by this method) without indicating the original hardness test method and values as well. :sign0016: to the Surface Engineering forum. Actually I'm aware of this dilemma. My aim is to find some way to express the HV hardness region for TSCs when some HRC value is known. This to provide some idea to people, not too deeply familiar with TS. For self-fluxing fused coatings I presume that standard conversion tables can be used. But when talking about high quality oxide ceramics and hardmetals, the std. tables give too low values. These coatings can usually be found in the area of 1000 HV +- 250 HV. Maybe a rough honest expression could be 750 - 1250 HV, for instance? When you can actually do HRC tests on coatings say like a fused NiCrBSi or a thick 13%Cr steel, then at least you can do cross reference tests to see if conversion tables are reasonable or not. With very hard coatings like oxide ceramics and cermets usually HRC tests are not possible. Come to think of it, I wouldn't use HRC for these in the bulk form either. I can remember someone trying to test a sintered tungsten carbide part (~1700 HV) on an HRC machine only to succeed in chipping the diamond indenter and breaking his test part in half. I have done a lot of work with hard coatings and measuring cross-section microhardness (HV0.3) and HR15N surface hardness (coatings in excess of 0.012" or 300 micrometre thick). From memory I will show roughly the relationship between HV/0.3 and HR15N and the corresponding conversion to HRC. Please note that it is not possible to verify the HRC conversion because the actual HRC test is not viable on these coatings and to be honest think that expressing the hardness for these types of material in HRC is a bit pointless and can be misleading. Edit: Please see revised hardness info a few posts down. Thank you once again Gordon. This was the best response I've had so far. Without any "offers you can't refuse", is it possible you could extend this list some further. It would help me in my task to modify the program for our ETS+S courses. We are trying to be as up-to-date as ever possible. A revised list of coating hardness. Memory obviously not quite so good Hardness values from a few of my old lab reports. The examples may not necessarily be typical of the coating type though The relationship between cross-sectional microhardness and superficial Rockwell (also effecting conversion to HRC) tends not to be very consistent, particularly between different coating types. Hope this helps.